I have to admit that I am not the biggest soccer fan. I mean, I watch the World Cup (duh, who doesn’t?) and my best friend Shantell plays so I’ve always liked to watch her games. But in terms of spending a Saturday afternoon doing homework while watching a game? I have to admit – not my thing. But honestly, can you blame me? I’m from the US – and Hawaii at that – it’s not as though I had endless opportunities to watch soccer or even knew someone who could explain it to me. 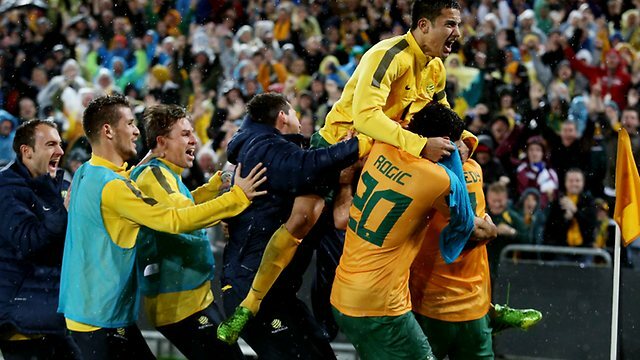 Last night, though, Boyfriend wanted to watch the Aus v Iraq game – the qualifier for the World Cup. Who was I to say no? Well, after MasterChef was finished, of course. While watching, I learned, and remembered, a few things. 1) Soccer players aren’t big babies – they’re drama queens. I have read the accusation that professional soccer players are actually baby girls about 1,430,648,201 times but I’ve never actually seen it in action. Last night when a player got stretchered off the field Boyfriend was shocked. Frankly, so was I (to be fair, we just spent the weekend watching Marc Murphy breaking his jaw on Luke Hodge’s shoulder so an incorrect tackle doesn’t exactly phase us). What even happened? Nothing, really. Just like nothing happened to that other guy who was laying on the field for five minutes while the game continued around him – when the umpire didn’t call anything he was up and running shortly afterwards. They do it in the NBA too – and I’m not a fan of it their either. Sports now are becoming liabilities so I understand the urge to fake it so the ref will call something on the other team but c’mon – you’re grown ups. Just stop killing the game. 2) Coaches know best. Another Boyfriend breakdown. He started cursing when Coach subbed off Cahill (who, I have recently learned is basically the Socceroo’s wonderboy) for Kennedy. It made no sense to him – or to lots of other people, apparently) but the gamble paid off. I know that we all like to get up on our high horses when coaches do things that make no sense to us – you should have seen me during the NBA 2008 Finals – but then I remembered that coaches spend a LOT more time with the players than we do. They know what they can handle and what they can’t. I remembered that sometimes… I just need to have faith. Sure, there was a chance that it didn’t work out… but it did. Go Coach. 3)There are too many Ben Kennedys in Australia. I can name 3 Ben Kennedys that are professional athletes. Seriously? What are the odds? Either it’s a lucky name (which I refuse to believe – we all know what happened to the American Kennedys) or there are a ton of other people in Australia by the same name. It’s amazing. How popular can one name be?! 4) ANZ has basically been empty every time I’ve been there. I mean, not really, but did you see how many people were packed in there? Talk about economic stimulation. 5) Sport has an uncanny way of bringing people together. There is only one thing that I can think of that unites people as quickly and as strongly (in a positive way – religion sometimes has some negative effects) than sport and that is a disaster – natural or otherwise. But that’s not a positive thing. Sport is. It almost gave me goosebumps to see all that green and gold at ANZ. In the US, we only unite for one sporting event: the Olympics. All other sporting events can be very divisive as everyone wants their team to win. Australia is much more nationally focused and that is a great thing.